They are the secret weapons of the bomb-sniffing world. Specially-trained “Vapor Wake” dogs are no ordinary canine cops. These dogs have been bred with the genes and skill-set to detect even the faintest hint of explosive particles in the air that humans leave behind as they walk. And they will be at the Super Bowl on Sunday in Atlanta as the New England Patriots take on the Los Angeles Rams in front of 75,000 people at Mercedes-Benz stadium. Tens of thousands more will be visiting the city just to be there for football’s biggest game. Even sea of people, these dogs can track a scent long after a person carrying explosives has moved through a crowd. “As you might imagine the threat level at such an event is considered high, and we go to great lengths to protect our teams and to put out as little information as possible leading up to the event as to not compromise existing security plans or measures,” Kristie Dober, VWK9’s director of business development, says. But more than 20 Vapor Wake dogs will be at Super Bowl LIII. Their names and photos are under wraps. The approach is different than traditional police and security dog training. These dogs don’t just find weapons, drugs or bombs on people or in packages. They are bred and raised to “sniff out explosive particles in the ambient air left in a person’s thermal plume,” the Alabama-based company says. “It was the Richard Reid attempted shoe bombing of American Airline Flight 63 in 2001 that prompted Auburn University to rethink how we screen for explosives,” he says. Auburn University’s College of Veterinary Medicine went to work in their Canine Performance Sciences Lab. The 18- to 20-month training program was developed for the dogs, which are a genetic cross between Australian Border Protection Labradors and U.S. Customs and Border Protection Labradors, according to the company. VWK9 Academy Video from Image By Design on Vimeo. Not every dog makes the cut. 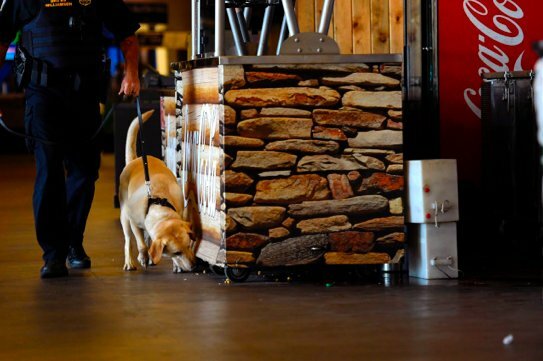 The puppies undergo cognitive testing, are even raised in the Alabama prison system to get them used to a world as counter-terrorist explosive detection dogs, and then learn to sniff the air for traces of body-worn explosives before being paired with a handler for further training. Now, 160 dogs are deployed throughout the United States. Police departments in Chicago, Detroit, New York and Los Angeles have them. So does AMTRAK, and university police departments including Notre Dame and Michigan State as well as professional sports teams such as the Detroit Red Wings and Jacksonville Jaguars. The dogs are put to work at special events. The Grammy Awards, Macy’s Thanksgiving Day Parade, New Year’s Eve at Times Square, and of course, the Super Bowl. They are also on paw patrol at concerts. The dogs have ringing endorsements. From the mayor of Lexington, Kentucky. To the New York Police Department, where they are part of the counterterrorism team. That’s where they are cruising the campus with the school’s police department. As well as pro sports. The St. Louis Cardinals were the first big league sports franchise to add them to the roster. 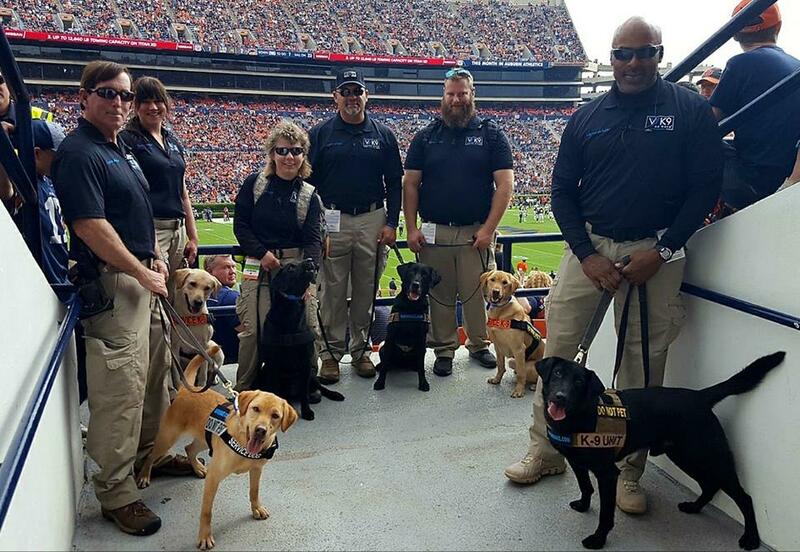 No matter who wins the NFL’s biggest game, these dogs know their way around the gridiron to help keep everyone safe. While there are no specific threats directed at the Super Bowl, according to officials, they have ramped up security for the big game.